I learned how to make oatmeal cookies when I was very young. It was one of my very first cookies to bake along with peanut butter. I was around seven or eight years old and back then the only oatmeal cookie recipes were for simple drop cookies. Oh, how time has changed this! 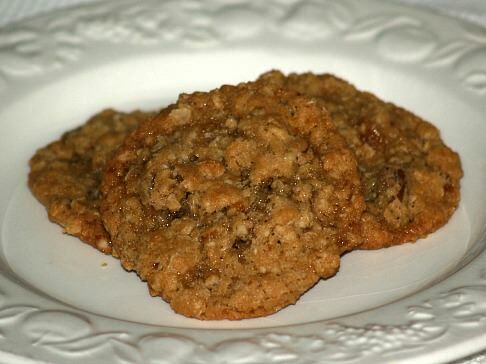 Today we have all kinds of delicious oatmeal cookie recipes. We have an abundant of different drop cookie recipes producing chewy wonderful texture. Many additional ingredients added such as chocolate chips, apricots, nuts and raisins create flavors unimaginable many years ago. I was able to learn how to make oatmeal cookies because a box of rolled oats was a staple in our pantry. Mom thought a hot bowl of oats in the cold winter was the perfect breakfast before going to school. Mom always knew that oats were high in vitamin, minerals and fiber plus they tasted good. They are really good with milk and brown sugar added. 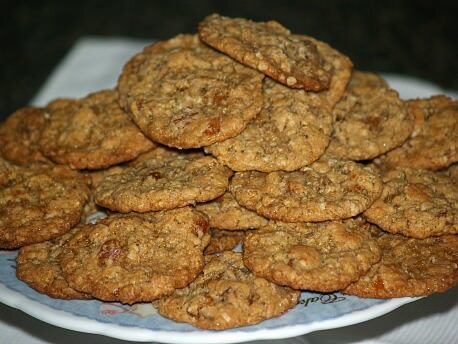 Through the years I have tried adding oats to other recipes since I learned how to make oatmeal cookies. They hold moisture in cookies as well as other baked goods. I found them great in making bar cookies, cakes, fruit desserts and also in meatloaf. If you are learning how to make oatmeal cookies, one thing to remember is not to over bake. Bake only until the edges are beginning to brown and the center is set. Baking too long will turn chewy cookies into hard cookies. When making oatmeal cookies, I cream the butter first with a mixer then adding the sugar and eggs. If after adding some of the flour the dough gets stiff, I mix in the remaining ingredients with my “clean” hands. This way I am sure to blend the ingredients thoroughly. Learn how to make oatmeal cookies with dried apricots. These are chewy and so delicious. Place apricots in small bowl and cover with boiling water; let stand 5 minutes and drain. In a large mixing bowl beat butter until creamy with mixer. Add about ½ of flour, both sugars, egg, baking powder, sodas, cinnamon and vanilla. Beat mixture until thoroughly combined; beat in remaining flour. Shape in small balls (about 1 inch); place on greased cookie sheet. Bake about 10 minutes or until edges begin to brown; makes about 48. Learn how to make chewy oatmeal cookies with chocolate and cherries. Preheat oven to 350F degrees; lightly grease and flour (COOL) baking sheets. Melt butter over low heat and add brown sugar; stir until sugar dissolves and begins to caramelize. Remove from heat and cool to room temperature; mix in granulated sugar, molasses, vinegar and vanilla. In separated bowl combine baking powder, soda, salt and spices. Add spice mixture into creamed butter mixture; beat in egg. Mix in flours, oats, chocolate chips and cherries; drop by spoonfuls on prepared baking sheets. NOTE: When cookies come out of oven they look gooey. Leave cookies on tray a few minutes before removing to cool completely. Learn how to make oatmeal cookies like these chocolate raspberry bars. In a large bowl beat butter until creamy; beat in brown sugar, baking soda and salt until combined. Stir into mixture the flour, oats and walnuts; stir in water 1 tablespoon at a time until crumbly. Press half of mixture into bottom of greased 9X13 inch baking pan. Combine together the jam and lemon juice; spread over the crust. Sprinkle remaining crumb mixture over the top; bake about 25 minutes until edges are lightly brown. Combine chocolate and shortening in small pan; heat and stir over low until melted. Drizzle over cookies; let stand until chocolate is set. Cut into 36 bars. Learn how to make oatmeal cookies with cocoa powder. In a large bowl combine butter and cocoa powder until smooth. Stir in remaining ingredients until well blended; let stand 10 minutes. Bake 7 to 9 minutes until set but not OVERBAKED. Remove from tray and place on cooling rack until completely cooled. Beat butter and sugar until fluffy; add remaining ingredients EXCEPT powdered sugar. Mix well; cover and refrigerate for 30 minutes. Shape dough into 1 inch balls; place on ungreased cookie sheet. Flatten each ball with the bottom of glass dipped in powdered sugar. Bake 12 to 15 minutes until edges are light brown. Cool 1 minute on tray; remove to wire rack until completely cooled. Dust with powdered sugar if desired; makes about 4 ½ dozen. Learn how to make oatmeal cookies that are thumbprints. Beat butter, sugar, eggs and vanilla until smooth. Melt 1 cup of the chips; blend into butter mixture. Stir in oats, flour, baking powder and salt; mix well. Cover and chill dough for 1 hour; shape dough into 1 inch balls and place on ungreased baking sheet. Place maraschino cherry in center of each cookie; bake 10 to 12 minutes until set. Remove to rack and cool completely; drizzle cookies with remaining melted chocolate. Learn how to make oatmeal cookies with chocolate that are no bake recipe. Melt butter over medium heat; add sugar, cocoa powder and milk. Bring mixture to a boil until slightly thick about 20 seconds. Stir in peanut butter and oatmeal; mix well and spoon out onto wax paper. Cool completely and store in airtight container; makes about 3 dozen. Learn how to make oatmeal cookies with rhubarb. In a large saucepan combine rhubarb, ½ cup brown sugar, 3 tablespoons water and lemon juice. Bring mixture to a boil and REDUCE heat to medium; cook and stir until rhubarb is tender about 5 minutes. In a small bowl combine cornstarch and 1 tablespoon of water until smooth; gradually stir into rhubarb mixture. Bring mixture to a boil; cook and stir until thickened about 2 minutes. Remove rhubarb mixture from heat; set aside. In a large bowl combine oats, coconut, salt and remaining ½ cup brown sugar; stir in butter until crumbly. Press half of crumb mixture into greased 8 inch square baking dish; spread with rhubarb mixture. Sprinkle with remaining crumb mixture; press down lightly. Bake 25 to 30 minutes until lightly browned; cool and cut in 16 squares. Learn how to make oatmeal cookies with blueberries. In mixing bowl cream butter and brown sugar; beat in egg and vanilla. In another bowl combine oats, flour, cinnamon, salt, soda and baking powder. Gradually add the oat mixture to the creamed mixture; stir in the blueberries. Drop by tablespoonfuls onto lightly greased baking sheets 2 inches apart. Bake 12 to 14 minutes until golden brown; remove cookies to wire rack to cool. Learned how to make oatmeal cookies with mincemeat filling or date filling. TO MAKE MINCEMEAT FILLING combine mincemeat, wine, sugar and lemon juice in saucepan. Simmer over low heat for 30 minutes; add chopped nuts and set aside to cool. NOTE: Spoonfuls of water can be added as needed throughout cooking. TO MAKE DATE FILLING simmer all ingredients stirring until thickened; se off to cool. TO MAKE DOUGH cream butter with sugar; add sour milk and oatmeal. Sift together dry ingredients and add to creamed mixture; blend well. Roll dough to ¼ inch thickness; cut with a large biscuit cutter. Place a spoonful of filling on the circle of dough; cover with another circle of dough. Pinch around the edges of circle to seal; place on lightly greased baking sheet. Bake 8-10 minutes (DO NOT BROWN). With mixer cream butter and both sugars until light and fluffy about 1 minute. Beat in egg and vanilla until well blended. In another bowl stir together oats, flour, baking powder, baking soda and salt. Stir the dry ingredients into the batter just to combine; stir in raisins and OPTIONAL ingredients. Drop by heaping spoonfuls onto ungreased baking sheet; bake 11 to 15 minutes until golden brown. Cool on sheet 2-3 minutes; transfer to wire rack to cool completely. Makes about 24 cookies. Learn how to make oatmeal cookies with pineapple and coconuts. Preheat oven to 375F degrees; lightly grease baking sheet. Place sheets of foil on countertop to cool cookies. In large bowl beat together brown sugar, shortening, egg, orange juice, peel, vanilla and extract. In another bowl combine oats, flour, baking soda, salt and ginger. On low speed of mixer beat dry ingredients into shortening mixture until blended. By hand stir in pineapple, coconut and macadamia nuts. Drop dough by tablespoonful onto prepared baking sheet 2 inches apart. Bake 10 to 12 minutes until cookies are lightly browned. Move cookies to foil to cool.